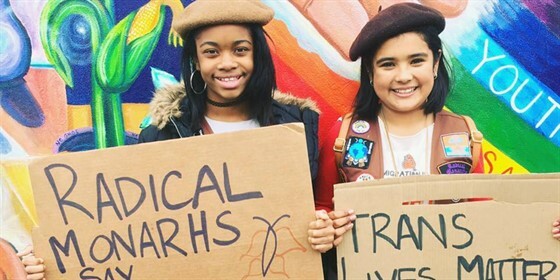 A group of tween girls chant into megaphones, marching in the San Francisco Trans March. Fists clenched high, they wear brown berets and vests showcasing colorful badges like "Black Lives Matter" and "Radical Beauty." Meet the Radical Monarchs, a group of young girls of color on the front lines of social justice, started by two fierce, queer women of color. Set in Oakland, CA, a city with a deep history of social-justice movements, the film documents the journey of the group as they earn badges for completing units such as being an LGBTQ ally, preserving the environment, and promoting disability justice. Filmed over three years, WE ARE THE RADICAL MONARCHS follows this mission-driven troop as they face the challenge of growing their organization, both before and after the 2016 election.